The documentation of Phanerozoic diversity patterns goes back to Phillips (1860) who used data from marine rocks in Great Britain to distinguish between Paleozoic, Mesozoic, and Cenozoic Life and showed that diversity increased throughout the Phanerozoic (see Miller 2000). Renewed interest in these large-scale patterns arose in the 1960s and 1970s, stimulated especially by the pioneering publications of Gregory (1955), Simpson (1960), and Newell (1967). The first diversity patterns published thereafter (Valentine 1969; Raup 1972, 1976a, b; Bambach 1977) showed mainly that this procedure was a very difficult task. The results were, in part, grossly dissimilar, especially with respect to the diversity increase in the Cenozoic. Although a "consensus paper'' was published shortly thereafter (Sepkoski et al. 1981), discussions of methodological problems continued till date. The interpretations of Phanerozoic diversity patterns have thus fluctuated between two extremes: it might be the real picture or an artifact of databases affected by different and heavy biases. There are problems with the taxonomic databases used which can add noise and possibly induce false signals (Signor 1985). Yet two databases at the family level compiled by Sepkoski (1982, 1992) and a team of specialists (Benton 1993) produced very similar and probably reliable results. The "pull of the recent'' refers to the fact that the modern biota is much more completely sampled than fossil strata and, therefore, tends to extend the stratigraphic ranges of extant families or species that are known from some time in the Cenozoic through intervals where fossils of those taxa are missing. Yet this bias seems to be a negligable quantity (Jablonski et al. 2003). Uneven sampling in different regions and in different periods is a fact that cannot easily be corrected for (Smith 2003). Yet it seems that the existing compendia accurately depict the large-scale global diversity trajectories (Adrain and Westrop 2000). Uneven time spans of the sampled intervals (usually stages) are a further problem. To correct for this, longer stages are subdivided, and very short ones are amalgamated (Sepkoski 1996). Taphonomic biases (differential preservation) are usually thought of as occurring randomly through the Phaner-ozoic, but potential biases can occur, e.g., through taxa that are only rarely preserved (e.g., in extraordinary deposits), producing a local peak in diversity for that stratigraphical interval (Sepkoski 1996). Culling of the data by removal of single occurrences (taxa that are confined to a single time interval) is the common procedure to remove this bias (Sepkoski 1996). Perhaps the most distracting factor when analyzing diversity patterns is that the sedimentary rocks available for study are not evenly dispersed through the Phanerozoic (Raup 1972, 1976b; Peters and Foote 2001; Smith 2001). 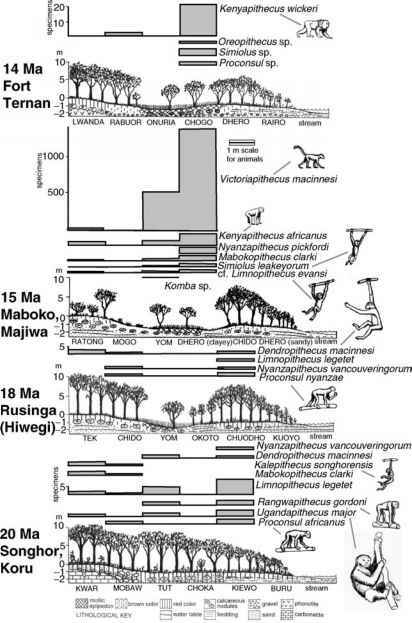 Yet the diversity trajectories seem to be real and independent of the outcrop area/sediment volume (Miller 2000).